"You must have chaos within to give birth to a dancing star." "Looking back now, I think I had a lot on my mind and was pretty nervous, but as soon as I started I forgot about it all. The only thing I thought was, 'Who cares, let's go!' I'm not the type of guy who runs behind someone else. I was going to run up front no matter what the pace was." The running community has been shocked by the death of Sammy Wanjiru. You can read about Wanjiru's accomplishments in this Letsrun obituary; it calls him the greatest marathon ever to live. He was 24 years old, just about to enter his running prime. The details of his death are still emerging, but Wanjiru had been hanging out with a tough crowd and had recently been arrested and not charged for a domestic disturbance. He was a troubled soul, and his death is sad. Our sport has an intimate relationship with death. The first marathoner was dead on arrival. When a race goes badly, we say bluntly that we died, and everyone knows exactly what we mean. As early as junior high, I used to describe the best race to myself as one in which I died just as I crossed the line. I would "kill myself" in speed workouts, sometimes take off in races on purpose at a "suicidal" pace. The language of running is the language of death. To run my best, it intuitively seemed to me that the first fear that I needed to overcome was the fear of death. A friend of mine recently told me that he began rock climbing as a teenager because it was the only thing that seemed real to him. The decisions he made mattered; they literally determined the difference between life and death. Was Wanjiru's brilliance as a runner bound up with a darker death wish? Is this the face of competitive determination and the haunted face of a man seeking death? 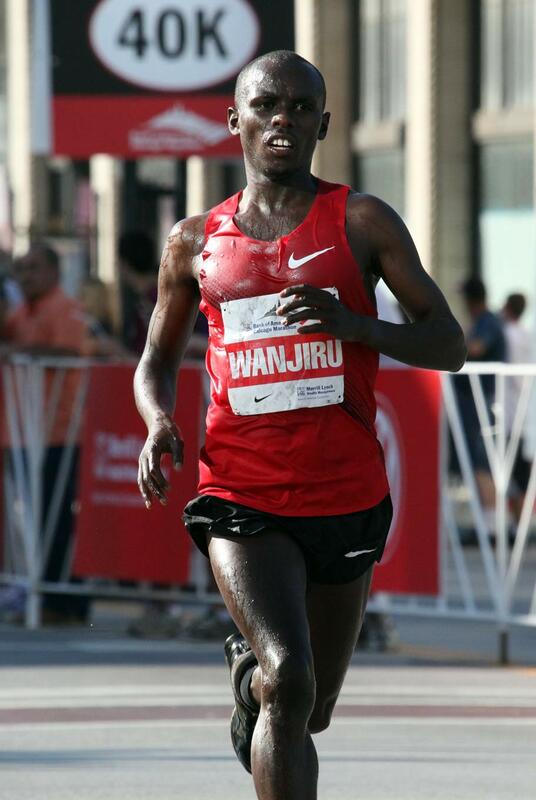 Wanjiru during his transcendent Chicago run. The sad thing is that we will never know. The other greatest marathoner ever, Haile Gebrselassie, runs with what appears to be total joy. Outside of running, he is cheerful, bright, and optimistic. His greatness is light and carefree. We always try to make sense of tragedies. Some have offered the theory that it was the fame that did Sammy in. I'm not sure that I agree. My guess is that Sammy lived with demons that neither running nor fame could touch. Perhaps it was his battle against those demons, his fight against the chaos within that gave him his tough, bold, and intense spirit as a racer. It's a hypothesis, and the truth is we will never know what motivated Sammy; he probably didn't know either. I suppose I like this way of making sense of Sammy's death because it makes the dark part of existence inseparable from its most thrilling heights. That's the way it's been for me--running towards death has been the same as living as hard as I could. Maybe the impulse to romanticize death and the demons is wrong-headed and a way of redeeming the unredeemable--Sammy's drunkenness, his violence, and his womanizing. Perhaps if these were not elements of Wanjiru's character, he would still have been great and would still be with us. The answers to these question will likely be known to no one. But there is one general truth that Sammy's life shows us: human greatness is not incompatible with human frailty. All races have the same finish line. Sammy got there first. "The language of running is the language of death." you have said elsewhere the language of running is the language of religion, or borrows religious language. and, so, here is the connection then - the dying connects the running to the religion. yes? or perhaps, not connected so much as sharing a language which attempts to describe something that is felt, and thereby defies description. A beautiful thing about language is its metaphoric capability. Some philosophers (Lakoff and Johnson come to mind) have argued that metaphor is at the root of all communication. You hint at this in your comment: metaphors work because they are vague and loose, and they therefore allow us to extract a meaning across differences. Since death is common to us all, it makes sense that we would draw on it for communicative purposes, to gesture towards the final meanings the activities of our lives, religious, athletic, and otherwise. Events like the death of Wanjiru remind us of the urgency of life. A race is a celebration of that urgency, and like all celebrations it often goes wrong, and we die before the finish line and are reminded of the ephemeral and precious nature of life. The world is full of tormented souls struggling daily with their demons, whether they be depression, substance abuse, anger, illness, bad decisions or what have you. Most of them suffer alone and die anonymously. Sammy didn't do that. He lifted the whole world up to a better place to be. As tragic as his death is, that is pretty awesome. Wow - powerful post. Wanjiru's death is a huge loss for the running world. Like Prefontaine we can now only wonder what would have been. On a side note, you're "killing yourself" in workout after workout taught me a lot about what it was going to take to be a successful runner. @mike: I think that nails it pretty squarely. @Jamey: Thanks, ha yeah, sometimes I think I probably shoulda taken it easier. That would have been the smart play. But smart isn't always the thing. While his death may be sad for those he has left behind, both family and fans, I'm certain in my belief that he has found the peace his spirit has long sought. And while it is always tragic when a person's life ends, we can take heart that he inspired and entertained many people the world over with his dedication, his strength, and his talent. I think its fair to say that any individual that goes beyond the pre-conceived ideas of what is possible does so because of tragic flaws. That is the nature of life: its a give and take. For the record (unless Let's Run has expanded their obituary) I believe the consensus is that Sammy ran the greatest marathon ever at the Beijing Olympics. Not that he was the greatest marathoner (though he was definitely great). But well said by everybody; including you, Jeff, and all the readers. Thanks, danny, for your thoughts and the correction! The idea of a tragic flaw has a long history in Western culture for sure. Behind the whole idea of tragedy, really, is a kind of deeper fatalism, a knowledge that as you say, "the nature of life is give and take." Tragedy reconciles us to life, its evils, and its inconsistencies while also acknowledging them. It kind of marks a limit point of human effort and intelligence. When we take stock of our own lives, our own flaws, we often come to the conclusion that our greatest strengths are also our weaknesses. And this is often true. But we have to also be sure not to let this conclusion authorize complacency of judgment with respect to our flaws--or the flaws that Wanjiru had. Balancing recognition of the tragic with the will to criticize ourselves and others on behalf of the elimination of problems is one of the most difficult--and necessary--ethical responsibilities.